Hello! 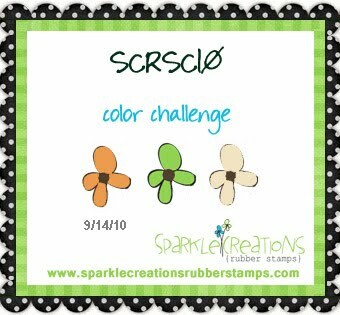 It's time another Sparkle Creations Rubber Stamps Challenge! Thanks to all of you who played along last week! Each week we will post an all new challenge at this time (9 PM PST on Monday). For all the details, please visit the SCRS blog. This week's challenge is a color challenge, and your inspiration colors are orange, green and cream. I chose some papers from the Kaisercraft Lush collection and decided the colors and soft patterns would coordinate with Fall Charlotte. I colored the images with Copic markers and paper pieced her dress and hat. My strips of paper and layout were inspired by the Mojo Monday 156 sketch. I added stitching to join the strips of patterned papers and finished my card off with some 3 mm and 4 mm silver flatback pearls. I love using pearls instead of brads and especially love the look of shiny silver pearls. I've searched around very extensively for these and was so happy when I found them at Pizzazz Aplenty. Judy has lots of wonderful embellishments at her store, so be sure to stop by and take a look! For more inspiration, please visit the SCRS blog to see the design team's wonderful creations. Accessories: Classic Rectangles LG, Scalloped Classic Rectangles LG Nestabilities (Spellbinders), Dotted Wave border punch (EK Success), Markers (Copic), Silver pearls (Pizzazz Aplenty), Crochet lace (May Arts), Foam tape, Thread, Sewing machine. Lovin' those pastel autumn shades, Stephanie! Ohh she is so PRETTY! What a beautiful card Stephanie! Your detailing is fabulous and Fall Charlotte is picture perfect! 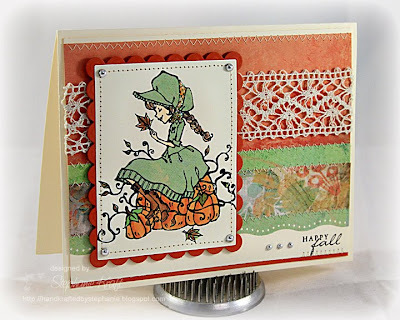 Wonderful use of the sweet pumpkin and girl. Lovely design.